The Founder of Peace and National Unity – Leader of the Nation, President of the Republic of Tajikistan Emomali Rahmon and Premier of the State Council of the People’s Republic of China Li Keqiang, accompanied by Chairman of the Parliament Shukurjon Zuhurov, Prime Minister of Tajikistan Qohir Rasulzoda, Chief of the Executive Office of the President of Tajikistan Rahmon Ozoda Emomali and Dushanbe Chairman Rustami Emomali took part in ceremonies to lay the foundation stone to the new buildings of Parliament and Government of Tajikistan. The construction of complex will be carried out in accordance with grant financial support of friendly and neighboring country – China in the amount of 1.5 billion yuans. 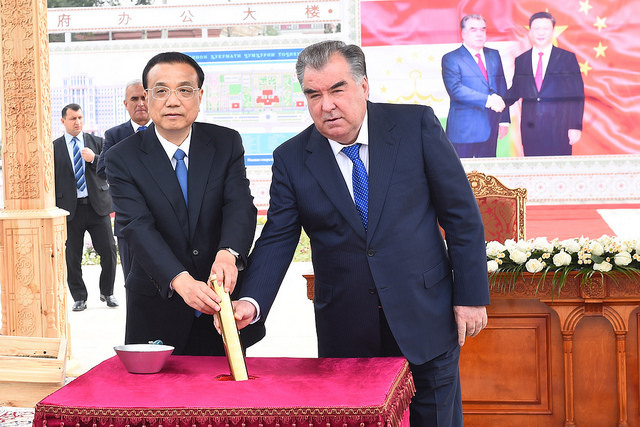 After the ceremonies, Leader of the Nation Emomali Rahmon and Li Keqiang became familiar with the projects. The main building of the parliamentary complex will be 49.7 meters in height and a total area of the complex will be 42,874 square meters. The governmental complex will consist of one 15-storey building and two 13-storey buildings and a total area of the governmental complex will be 10.27 hectares. It will be built in accordance with modern requirements and national architectural style.